Oh Singapore. You're kind of the best. Your clean streets and law abiding citizens. Your, green spaces, clean air, orderly and timely trains, lack of democracy, forbidden chewing gum and lashings with canes, oh wait, what?? I probably love Singapore so much because it's just the right antidote to the crazy of Jakarta city life. And we all know that I do adore some crazy chaotic city life, but it is nice to get a break once in a while. And besides, I'm sure all the orderliness and the state-sponsored beatings would get to me if I actually lived in Singapore. When we were in Singapore a few weeks ago we hit up the Singapore Zoo. And while we're normally big fans of democracy, in this instance the Chef and I sidelined our own democratic principles and force marched Stella to the zoo. You see, he and I really wanted to go. I mean. Orangutans! And polar bears! And green space! And walking! Stella, on the other hand, well, she was not into the idea. Not at all. Singapore Zoo? That'll be a big fat NOPE. 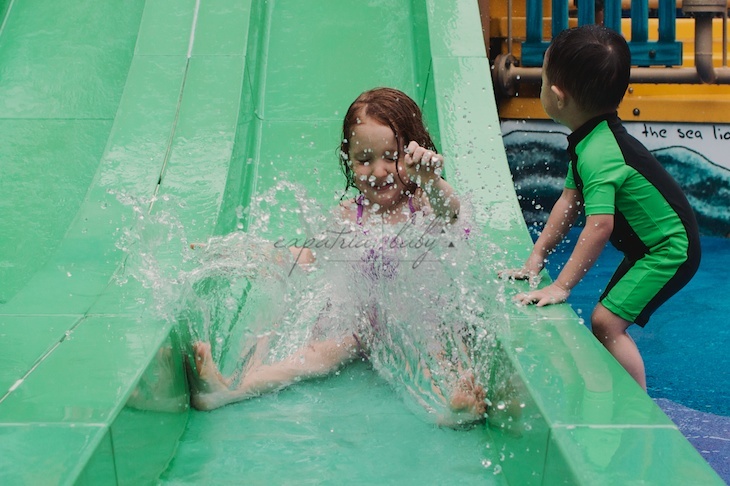 Anyway, we employed one of our favourite covert parenting techniques, and showed Stella YouTube videos of the Singapore Zoo splash pad and were all like, SEEE! The zoo is AWESOME! There are no elephants! Only water slides!!! And good thing too. The Singapore zoo is fantastic. Really. It's a must visit. The exhibits are all lovely, recreating as much as possible a natural habitat using environmental barriers instead of fences and bars. There are orangutans who roam free range around the park. You can ride a mini-tram which, when you're three, is pretty outstanding. And the water park? Well. Bonkers. There's lots of good food options, but less in the way of healthy snacks. So bring some? I vote for visiting on an overcast day. It's so much less hot! Bring a bathing suit and towel for the littles. And for you too, unless you're allergic to fun. The splash pad is not to be missed. Under any circumstances. A taxi from downtown will run you about 25 Singapore dollars. But be warned, if it starts bucketing down with rain, you'll have no chance of getting a taxi back to the city. It seems as though people were calling a reservation hotline to order taxis. And if you have a phone that works, I'd suggest this as the way to go. We opted instead to take a bus to the nearest MRT station. It took us a good hour to get back this way, but was preferable to waiting for all eternity to get a cab. And Stella will take ANY excuse to travel by bus and / or train. So.